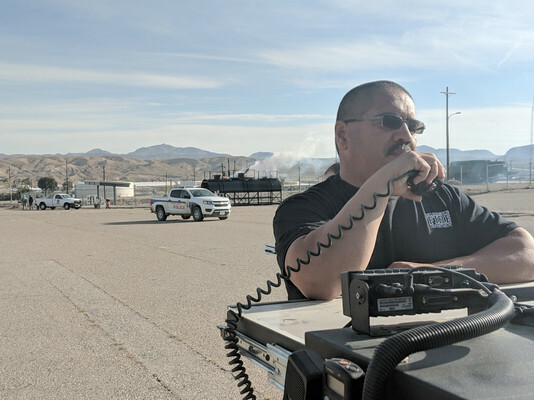 A simulated rail tanker car carrying thousands of cubic feet of chlorine gas sprang a leak and sent a cloud of toxic gas drifting across Marine Corps Logistics Base Barstow, California and into the nearby city of Barstow, as part of a training exercise, March 19. The fictional release of the corrosive gas was part of a base-wide training operation dubbed Exercise Haber Rail. The fictional chlorine gas leak occurred just after 8 a.m., from a tanker car sitting on the rail tracks north of the warehouses aboard the Nebo Annex of MCLB Barstow. The Emergency Operations Center at the Mission Assurance Department was stood up and staffed with personnel from every department aboard Base. Their mission during the exercise was to execute a plan to protect lives and property by stopping the gas leak, and evacuating the base if necessary. Major Ernest Robinson, Assistant Operations officer, was the Senior Watch Officer in charge of the EOC, providing overall guidance for response to the fictional emergency situation while personnel from each department at the EOC performed their own individual functions as part of the whole. Running an EOC is a demanding task which Robinson acknowledged is not a one-person endeavor. “I appreciate the support and assistance from all sections in bettering the base’s ability to react to incidences both man-made and natural,” Robinson said. “I am thankful to all the tenant organizations and residents that have demonstrated true patience as we identify critical gaps and shortfalls within the emergency management program in order to ensure their overall safety and protection. Employees not in the immediate path of the fictional gas plume were told to shelter in place by closing all doors and windows and turning off their heating and air conditioning units and survive on the relatively cleaner air inside their homes and offices. Decontamination sites were set up to treat those exposed to the chlorine gas. The “2016 Emergency Response Guidebook,” consulted by first responders nationwide in how to handle hazardous waste and materials spills, describes the symptoms of chlorine gas exposure as consisting of burns to the mucous membranes of the eyes and mouth as well as burns to the throat and lungs. Safe gathering points for those not exposed to the gas were established at the Semper Fit Gym and at the Desert View Housing Community Center. Meanwhile, access into the Base was cut off to all but emergency personnel while the safest routes off Base were plotted, and Marine Corps Police Department officers directed fleeing employees to return to their own homes in the civilian community. Under the Colonel’s direction, the social media platforms of Facebook and Twitter were used to keep the base and civilian populations constantly informed during the exercise, including photos of first responders, Marines and civilians working at various simulated staging areas. The CO said training exercises such as standing up the EOC during a hazardous materials spill is just part of a larger ongoing mission to keep Marines and first responders on their toes.